For those of us who are unable to attend the daily morning program at a Hare Krishna Temple, thanks to this Prabhupada Morning Program CD we no longer have to miss this important part of our sadhana. For your morning worship while traveling, the unique packaging provides a small altar graced by Srila Prabhupada, the Disciplic Succession, Radha-Krishna, the Panca Tattva and Lord Nrsimhadeva. The perfect way to remain inspired in Krishna Consciousness. Now includes the songbook "Songs of the Vaisnava Acaryas"
Wherever possible, the Morning Program CD features His Divine Grace A.C. Bhaktivedanta Swami Prabhupada singing and speaking. The contents of the Morning Program CD are arranged sequentially as they are performed in every ISKCON Temple. Hare Krishna Kirtan: chanting of the Hare Krishna mantra in a call and response fashion. Deity Greeting: It is a tradition established by Srila Prabhupada in ISKCON Temples that at 7:00 am the devotees gather in the temple and great Their Lordships Sri Sri Radha Krishna and during this Deity Greeting the song "Govindam" which was produced by George Harrison is played. The "Govindam Prayers" are included here. Siksastakam: Lord Sri Caitanya Mahaprabhu, although He was a very great scholar, only wrote six verses. These six verses are the amazing Siksastakam Prayers. The entire philosophy of Krishna Consciousness is contained within these beautiful prayers. Ten Offences in Chanting the Holy Name: There are ten offenses in regard to chanting the Hare Krishna Maha Mantra so as part of the daily morning program devotees recite these ten offenses so they can remember them and try to avoid committing these offenses. Jaya Radha Madhava: Srila Prabhupada Chanting Jaya Radha Madhava. This is done before the Srimad-Bhagavatam class each morning. Srimad Bhagavatam Class Invocation: some auspicious mantras that are chanted before the recitation of the Srimad Bhagavatam. Songs of the Vaisnava Acaryas -- Temple Song Book: This is the traditional ISKCON Hare Krishna Temple Song Book. A collection of songs composed by Thakura Bhaktivinoda, Narottama dasa and other great acaryas of the Gaudiya Vaisnava community (sampradaya). These songs have been made popular in the Western world by His Divine Grace A.C. Bhaktivedanta Swami Prabhupada. Japa CD: Hare Krishna devotees vow to chant at least 16 rounds of the Hare Krishna maha-mantra daily. This Japa CD is Srila Prabhupada and the assembled devotees chanting japa. It is a tradition in ISKCON to play the "Prabhuapda Japa Tape" during the morning program. It helps us concentrate on our own japa. You will also receive this "Prabhuapda Japa Tape" which is now a "Prabhupada Japa CD" of course. In addition to the Morning Program CD and the Srila Prabhuapda Japa CD you receive a CD containing three wonderful classes by Srila Prabhupada titled. "Why We Chant Hare Krishna." In these discourses Srila Prabhupada elaborates on the meaning of the Hare Krishna Maha-Mantra. This beautiful package consisting of the "Traveling Temple" alter, 3 audio CDs and the "Songs of the Vaisnava Acaryas" Temple Song Book will enable you to recreate the atmosphere of a Hare Krishna Temple anywhere you may be. 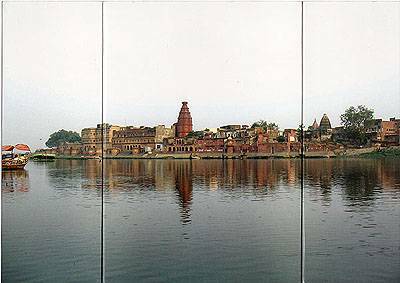 This is the beautiful Yamuna River in Vrindavana, it is the back of the "Traveling Temple"
Question: Is this made from cardboard? I'm a newbee and looking to start a home temple for my chanting....would this alter do the job?